Ascension Lutheran Church, originally named Mt. Calvary Lutheran Church, held its first worship service on the evening of May 10, 1931 at Wesley Heights public school. Three people attended that first service: Mrs. Laura Belle Taylor, a pianist by the name of Miss Price, and the founding pastor, Rev. Leslie F. Frerking, who was at that time serving as the Lutheran Church – Missouri Synod (LCMS) Missionary-at-large for the Carolinas. Three evening services averaged only three in attendance, but Sunday morning worship assured the continuation of the Mission. The first Sunday School classes were held on June 7, 1931. The first baptism was performed on June 28, 1931. In 1939, the congregation was able to become self-sustaining with subsidy funds provided by the Mission Board of LCMS. On May 30, 1939, Missionary Frerking was officially installed as the first pastor of the congregation. In October 1940, the congregation went on record as favoring the establishment of a Christian Day School. 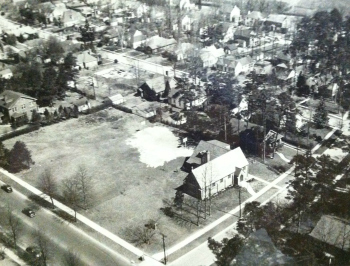 In August 1942, property was purchased at the corner of East Morehead Street and Kenilworth Avenue, and on September 23, 1945, the cornerstone was laid for Ascension Chapel and School. The Christian Day School was able to begin classes in the facilities on February 12, 1946, and the church office was moved to the new location as well. Divine Services in the chapel had to be delayed until August 4, 1946, because of a lack of furniture and organ. One can imagine the joy that the congregation felt when the chapel was finally dedicated on November 2, 1947. Since its beginning in 1931, Ascension has been blessed by six senior pastors. Ascension has also been instrumental in releasing members to form other Lutheran churches in the Charlotte area. Many changes have occurred since that evening in 1931 when the first worship service was held, but throughout all of them the Lord has richly blessed the congregation and its leaders.